A few weeks back I got my nose pierced. Yes, I'm aware I'm not 22. And no, I'm not going through some late-quarter-life, early-mid-life crisis. It's something I've been wanting to do for years. I've always seen other woman with nose piercings and thought they looked so beautiful and cool. I've never felt all that cool. Or, all that beautiful for that matter. No, I'm not looking for reassurance. I'm not fishing for compliments. I'm guessing most of you reading this are women. And probably women with slightly less than overflowing self-esteem. For the record, you are beautiful. Full to the brim with warmth and joy and sweetness and strength. I know this. And I know you think I'm beautiful. Or, at least, not hideous. We're in agreement about our feelings for each other. And I'm guessing, we'd probably be in agreement about our feelings for ourselves. I hope we're not. But I'll assume we are. So here we are. And here I am. With these cartoony eyes and deepening lines on my face and my ever-growing nose and eyebrows I always feel look a little cro-magnon mannish. I know, I know. The stories we tell ourselves about ourselves. And I'm not 22. Not even close. Almost 34 in fact. And wanting a nose ring for years. Because the person in the mirror isn't quite the person I feel like inside. But for years I told myself I could not be the person with the nose ring. Why? Because I'm a big 'ol dork is why. Because I'm normal (though in an obviously abnormal way). Because I follow the straight path from Point A to Point B. Because I always mean to do the right thing and never want to rock the boat. I care what people think. And I always thought that if I got a nose piercing that people would think I was trying to be someone I'm not. Which is to say, the cool, edgy girl, when obviously ... not. Or, that it was an act of rebellion. Maybe if it were 1998 I could see a nose piercing being a sign of youthful rebellion. But come on. Body piercings are as ubiquitous as Starbucks now. Maybe it's really an act of rebellion against the person I always thought I was. All those stories I've always told myself about the person I was and am and will be. Maybe that's what a late-quarter-life, early-mid-life crisis is. In which case I revise my earlier statement. Maybe I am going through a late-quarter-life, early-mid-life crisis. Crisis is such a loaded word, and I don't think it's really a crisis anyway. It's pretty great to re-evaluate my life and realize that my narrative is mine and can change based on the choices that I make. So a few weeks ago I chose to get a nose ring. And I love it. I look in the mirror and see myself and I like that person a little more. Not because of the stud on it's own. But because it means that the voice in my head that was telling me to be true to me was louder than all the voices outside telling me to conform to to the image of the almost-34-year-old wife and mother of two that I imagine the rest of the world has. This is my one life. It's time to start owning it. 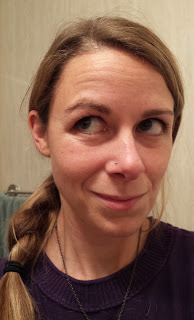 Yes, a man poked a hole in my nostril with a large needle. It was hurt. But the pain didn't last long. Does stuff get caught on it? If by stuff you mean boogers and snot, then yes, stuff gets caught on it. Just like stuff gets caught on your nostril walls. I was perpetually self-conscious about the state of my nose before I got the piercing. That hasn't changed. Luckily, someone invented facial tissue that can be used for debris removal. There's not back on it, like an earring. The stud is a corkscrew shape (it looks like this). I learned this when it fell out the other day while I was taking a shower and couldn't figure out how to get it back in so then made my very patient, very kind husband put it back in. It's tricky! What made you decide to get it?